Last month I did a sketch of a little froggy prince and shared it on one of the online discussion forums where we often share images of our work- I was advised of the original story and fairy tale origins, and went a-Googlin' for Grimm and other versions of the story. "The Frog King" or what we know as "the frog prince"/"princess and the frog" etc etc was originally "Der Froschkönig oder der eiserne Heinrich" by Jacob and Wilhem Grimm, and the frog was not kissed but rather thrown against a wall in disgust. Getting to the source of a "happily ever after" sometimes inspires me even more, although I did not make a piece that was literal on this. Instead the research process became a conversation about unconditional love that spawned my idea around the imagery. I have noticed that I have been doing lots of art with themes of "selection" and "want", maybe because that is something that is a psychological trait that exists a little in most people I know, even if they try to keep it hidden. There is something we desire, even if it is to see another person happy, there is still a want. And we have opportunities to choose, even if sometimes we feel like we don't. That is something that I have felt has been at the front of my mind lately, not like the big-sad-issues-of-the-world-type choices (although those are there and I face them too! ), but just in every day- can I really make this happen?- kind of choices. So here are some photos from my mixed media painting "Among Many", and some captures of me working on it. 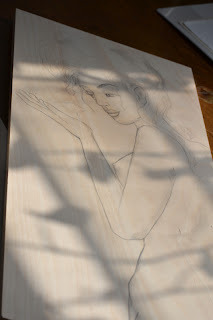 The intention is for the wood grain to show through, but to still be very pale. 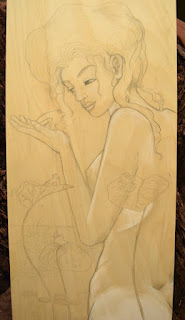 notable colors that are being added are a bronzish acrylic and a pearl white to her hair. 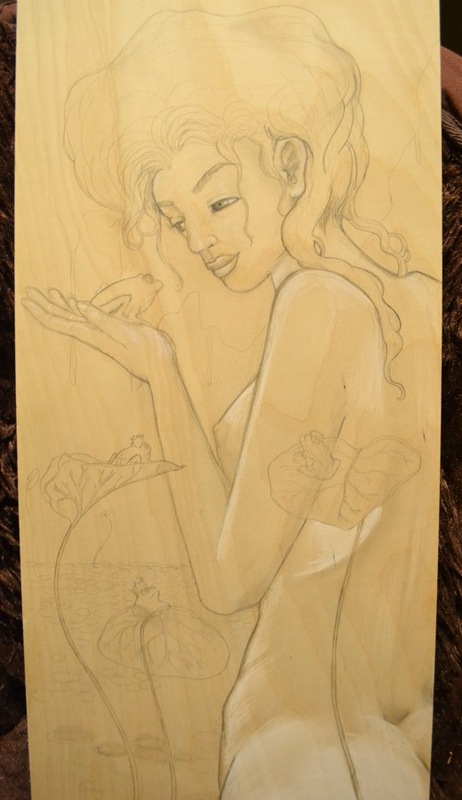 12x24 inches, graphite, colored pencil, acrylic on birchwood. I hope you enjoyed seeing the process for this piece! I have listed new prints in my etsy store...and I am planning new little contests for my FB page if you haven't wandered over to "like" it yet! 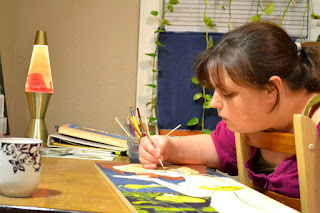 Coming soon on this blog I will be sharing the new little painting I will be sending off (once again) to Norway!